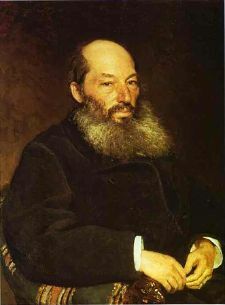 Fet's portrait by Ilya Repin. Afanasy Afanasievich Fet (Афанасий Афанасьевич Фет, December 5, 1820—December 3, 1892), or Foeth, later changed his name to Shenshin (Шеншин), was a poet who dominated Russian poetry during the last quarter of the nineteenth century. Fet's life was anything but poetic—his views were contrary with his times. He was a conservative in a revolutionary time when the serf were emanicipated and anarchist, populist and Marxist groups—like Narodnaya Volya and Land and Liberty—were one the rise. However, as a poet he was ahead of his time, adopting the view of "art for art's sake" that would characertize the Russian Symbolists that would follow him. Afanasy was the child of a German woman named Charlotta who was initially married to Johann Foeth. She remarried a rich Russian landlord named Shenshin in 1822 after Afanasy's birth in 1820. It is unclear if Afanasy was the son of Foeth or Shenshin, but the decision was made by the Holy Consistory in Orel that he would go by his German father's name because the marriage between his mother and his Russian father was not legitimized soon enough. This was quite traumatic for him as he completely identified himself with Shenshin and not Foeth. He spent his youth studying at the Moscow University and serving in the army until he resigned his commission in 1856. In 1857 he married the sister of literary critic, Vasily Botkin. She provided him the means that had been denied him in his family, and he became a successful landowner. The stigma of illegitimacy haunted him all through his life, and after years of litigation he obtained the right to use the more prestigious name Shenshin (1876). Promotion in the army ranks helped him to secure the longed-for admission to Russian nobility as well, just in time when the serfdom was abolished. Fet was despised and ridiculed by the Russian radical intelligentsia as a mean personality of reactionary political views, but this had little impact on his work. Fet believed that the poetry should be written only for the sake of poetry so the poet's lifestyle should have little bearing on his art. While in the army, he made friends with another officer, Leo Tolstoy, whom he always admired. Later he settled at the Stepanovka manor in his home district of Mtsensk and visited his illustrious neighbor as often as possible. Among Tolstoy's friends, he was the only professional man of letters. After becoming a landowner, he wrote in favor of the gentry' rights. He wrote little poetry during this time in the 1860s and 1870s. In his later years, he also wrote literary reminiscences and translated the Aeneid of Virgil as well as Schopenhauer's The World as Will and Representation. At an old age, when his suffering became unbearable, Fet attempted to follow Schopenhauer's advice and commit suicide but was stymied by his family. He died from a heart attack during another suicide attempt. When Fet first published his poetry in 1842, he was timid enough not to trust his own artistic taste. He therefore submitted his verse to the examination of the well-known realist novelist and underappreciated poet Ivan Turgenev, whom he respected as an arbiter of literary tastes. This tradition continued for many years, until Fet came to realize that Turgenev had expurgated from his verse the most personal and original elements of his artistic vision. Some of his best poetry was written later during his life, during the 1880s. In particular, during his old age he wrote love poetry, especially reflecting on love lost. The subjects for Fet's poetry are far from original. In addition to unrequited love, he takes up themes like the nature of Central Russia, the perfection of a Greek statue, and majesty of God. But he treated them in an impressionistic manner, always trying to catch a moment of volatile change. He could write a poem consisting of only nouns and adjectives, as he did in "Whisper, timid breathing" (1850)—a favorite of Dostoevsky and yet make an impression of restless dynamism. His last pieces, arguably influenced by Baudelaire, are intricate and obscure—the images are meant to evoke (rather than to record) subtle associations of half-forgotten memories. He once said that the most important thing in poetry is a thread that would bind all the rambling associations into a tightly structured short poem. Fet was never a popular poet during his lifetime. But he had a profound influence on the Russian Symbolists, especially Innokenty Annensky and Alexander Blok. His reputation grew through the success of the Symbolist movement and he is now firmly established among all-time Russian greats. Gustafson, Richard F. The imagination of spring: the poetry of Afanasy Fet. Yale University Press, 1966. This page was last modified on 5 February 2019, at 00:38.